Milly Maloo is a funky kind of monkey. and gardens as wild as her frizzy red hair. and a shiny gold ring in the end of her nose. One day Milly Maloo receives an invitation in the mail for which she requires a hat to attend. With her hat in sad disrepair Milly pops next door and asks her friend Penelope to help. Penelope is the very opposite of Milly; sensibly dressed and practical in every way. She lends Milly her hat which is black and shiny but rather dull. Milly does not despair, she gets her glue and decorates it. When the time comes for Milly to return the hat she can’t get the decorations off!! Oh what will Penelope say? 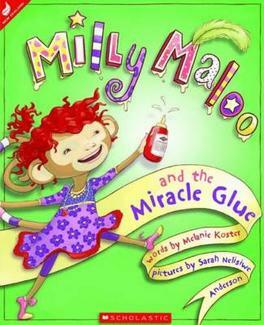 Milly Maloo and the miracle glue is a story of friendship in a fun and quirky tale brought together by super glue. Melanie Koster’s words are a delight to read and flows from your tongue without fault. Paired perfectly with Sarah Nelisiwe Anderson’s glorious illustrations Milly Maloo and the Miracle Glue is another great rhyming book for all from the talent found by Scholastic NZ. Join Milly in her flamboyant world filled with colour and adventure, mess and a touch of mayhem for a frolicking good time. Daisy’s Maze – Kyle Mewburne, Michaela Sangl. Willbee the Bumblebee – Craig Smith, Maureen Thompson, Katz Cowley. The Fidgety Itch – Lucy Davey, Katz Cowley. Marmaduke Duck and the Marmalade Jam – Juliette MacIver, Sarah Davis. A Bug in a Book recommended read.